The heartland of the Cholas was the fertile valley of the Kaveri River, but they ruled a significantly larger area at the height of their power from the later half of the 9th century till the beginning of the 13th century. The whole country south of the Tungabhadrawas united and held as one state for a period of two centuries and more. Under Rajaraja Chola I and his successors Rajendra Chola I, Rajadhiraja Chola, Virarajendra Chola and Kulothunga Chola I the dynasty became a military, economic and cultural power in South Asia and South-East Asia.The power of the new empire was proclaimed to the eastern world by the expedition to the Ganges which Rajendra Chola I undertook and by the naval raids on cities of the maritime empire of Srivijaya, as well as by the repeated embassies to China. The Chola fleet represented the zenith of ancient Indian sea power. 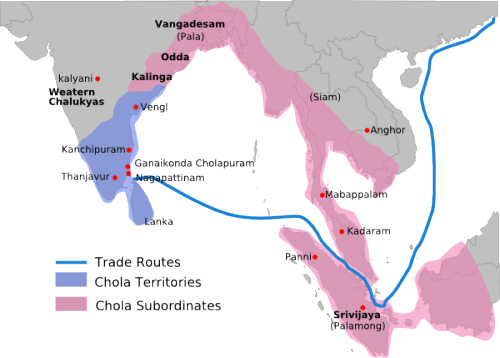 During the period 1010–1200, the Chola territories stretched from the islands of the Maldives in the south to as far north as the banks of the Godavari River in Andhra Pradesh. Rajaraja Chola conquered peninsular South India, annexed parts of which is now Sri Lanka and occupied the islands of the Maldives. Rajendra Chola sent a victorious expedition to North India that touched the river Ganges and defeated the Pala ruler of Pataliputra, Mahipala. He also successfully invaded cities of Srivijaya of Malaysiaand Indonesia. The Chola dynasty went into decline at the beginning of the 13th century with the rise of the Pandyan Dynasty, which ultimately caused their downfall. The Cholas left a lasting legacy. Their patronage of Tamil literature and their zeal in the building of temples has resulted in some great works of Tamil literature and architecture. The Chola kings were avid builders and envisioned the temples in their kingdoms not only as places of worship but also as centres of economic activity.They pioneered a centralised form of government and established a disciplined bureaucracy. The Chola school of art spread to Southeast Asia and influenced the architecture and art of Southeast Asia. The Cholas are also known as the Choda.There is very little information available regarding their origin. Its antiquity is evident from the mentions in ancient Tamil literature and in inscriptions. Later medieval Cholas also claimed a long and ancient lineage. Mentions in the early Sangam literature (c. 150 CE) indicate that the earliest kings of the dynasty antedated 100 CE. Cholas were mentioned in Ashokan Edicts of 3rd Century BCE as one of the neighboring country existing in South.